I love poring over paper AAA maps. Jim prefers online mapping software. Both are fun. The last two days we've been busy doing more planning for our trip to the Canadian Maritimes later this week. Our plans are about as viscous as when we went through Canada and Alaska two years ago. Since we haven't been to the Maritimes before, we want to be as flexible as possible. We aren't even sure how long we'll stay in Canada. There are lots of variables. While we have a good internet connection at our current campsite we're doing lots of online research about places to visit and and things to do in the Maritimes. 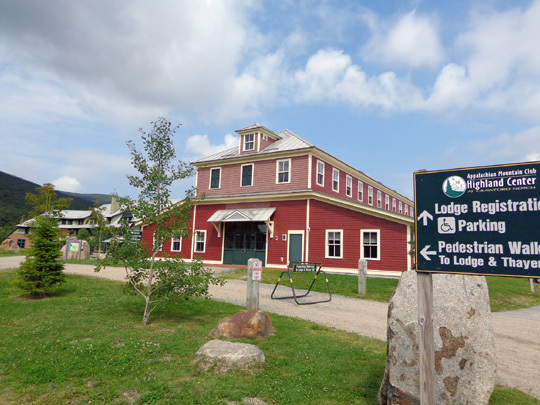 We've devised a tentative route through Maine, New Brunswick, Nova Scotia, and Prince Edward Island to hit interesting scenic, historical, and other highlights. 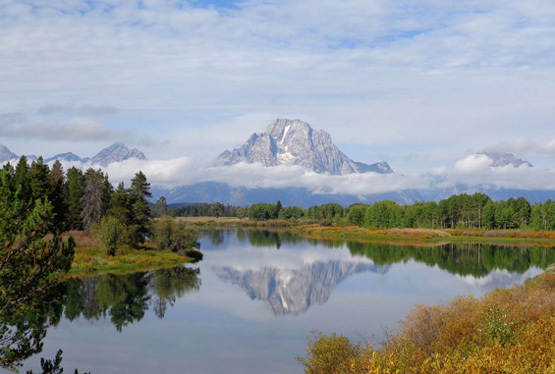 We're also researching campground options, distances between tentative destinations, diesel costs, exchange rates, phone and internet service, health coverage (Medicare doesn't work in Canada unless you're passing through to Alaska), and other financial considerations. Jim has been doing routine maintenance on the vehicles to make sure they are travel-worthy for this leg of our journey. He also installed new air bags on the truck this week so our ride will be more level and smooth towing the Cameo. We're hoping the roads are better in the Maritimes than they were in British Columbia and the Yukon. The more we read about the Maritimes, the more excited we get about going to these provinces! They sound beautiful and all the people we've talked to who have visited the area loved it. 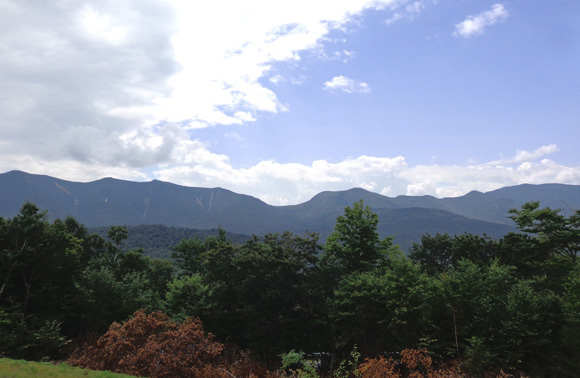 Meanwhile, we have more plans for our remaining four days in the White Mountains of New Hampshire. There is a whole lot to see and do here, too. 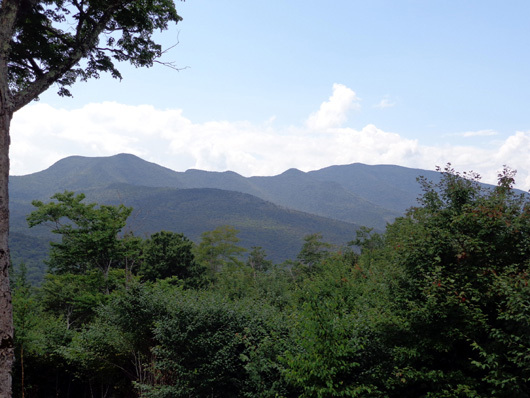 In fact, we like this area -- and campground -- so much, we plan to stop by here again for a week or two in September when the autumn leaves should be near their peak. We're going to try to follow the fall leaves through New England and south to the Mid-Atlantic this fall. This morning began with low clouds and a few drops of rain. The clouds mostly lifted by 10 AM so we decided to drive a loop around the Whites. There were clouds all day and a bit of rain in the southern Whites about 1 PM while we were driving but we still got to see some beautiful mountain scenery that was new to us. 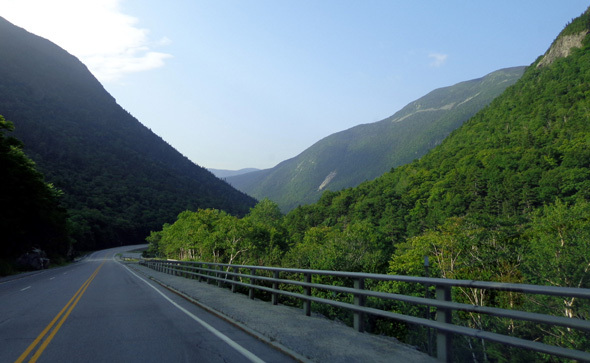 A railway follows the road through Crawford Notch; the tracks are on the right. 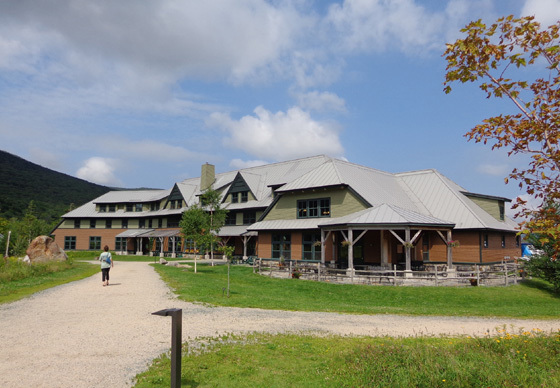 We drove south from Twin Mountain on US 302 through Crawford Notch, stopping at the Highland Center. Neither of us has been in there before. 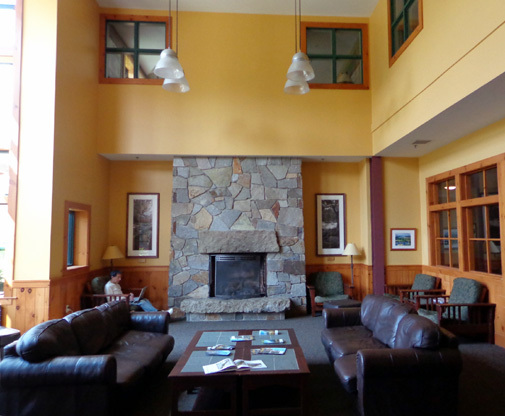 It has a very nice lodge and several trails begin there. I'll have to check those out another time. I bought some lightweight Smartwool socks and an ergonomic coffee travel mug with the AMC logo. 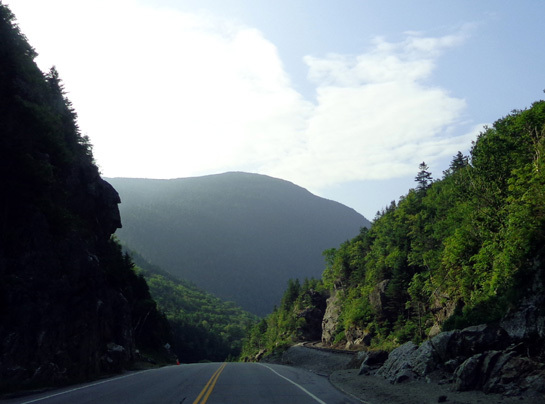 We continued south through Crawford Notch. 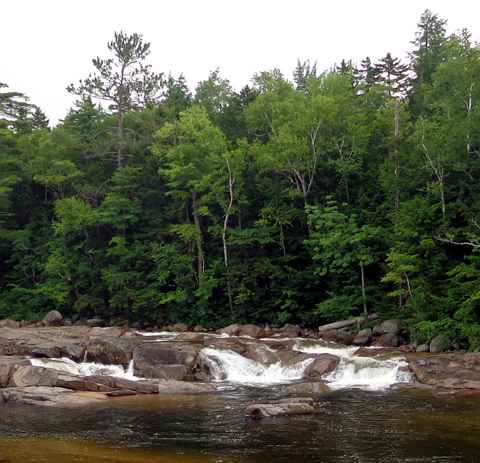 I noted various trailheads I might use tomorrow or the next day, including the one to popular Arethusa Falls. 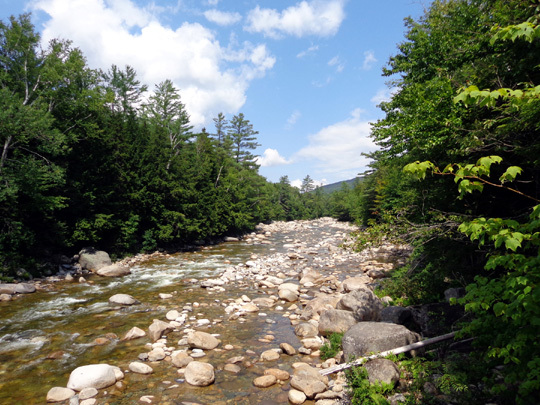 The road curved east through several communities -- Bartlett, Glen, Intervale, North Conway, and Conway. Traffic increased the closer we got to busy North Conway. It was stop and go for about a mile through the business area. We didn't realize it would be such a tourist trap with so many shops, resorts, attractions, restaurants. East of Bartlett on the Saco River we passed a covered bridge that isn't used for traffic any more; there were goods for sale inside. 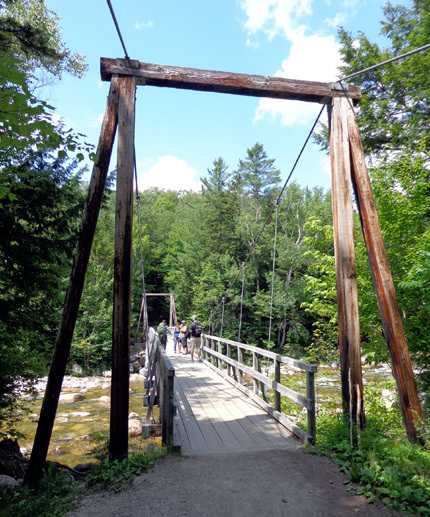 Later we saw two covered bridges that are still in use by vehicles over the Swift River. 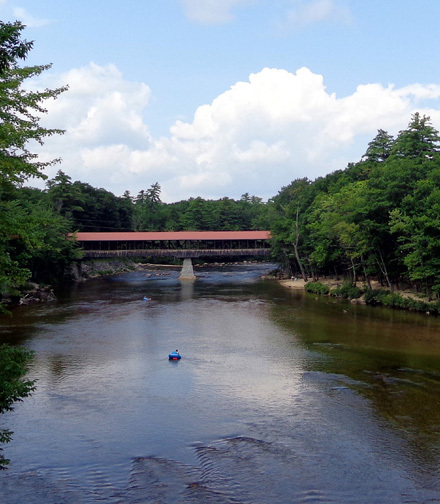 We drove through the other covered bridge over the Swift River about six miles west on ME 112, also known as the Kancamagus Hwy. It was raining a little bit and I didn't get a good picture of that one. 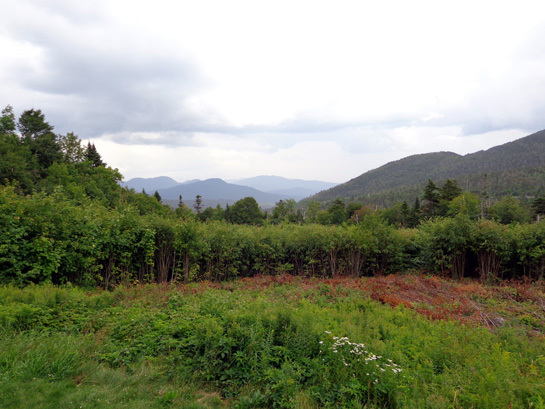 We followed the Kancamagus Hwy. for about 37 miles between Conway and Lincoln. Some of it was very bumpy, some was smooth. Road crews were working in several places. 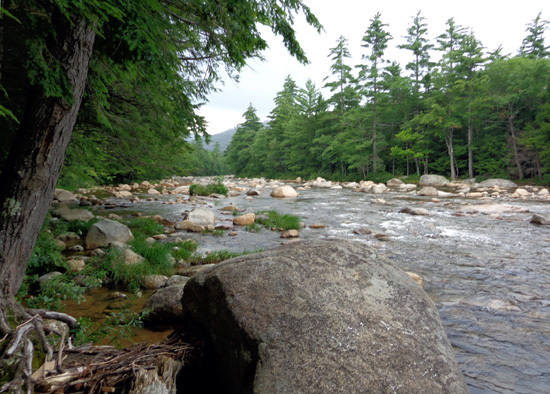 We passed lots of trailhead parking areas and small campgrounds, saw some lakes, and went over a 2,800+ foot pass with great views of surrounding mountains and the Pemigewasset AKA "Pemi" Wilderness. We also stopped at the Lincoln Visitor Center. It was closed but a couple dozen vehicles were parked there. 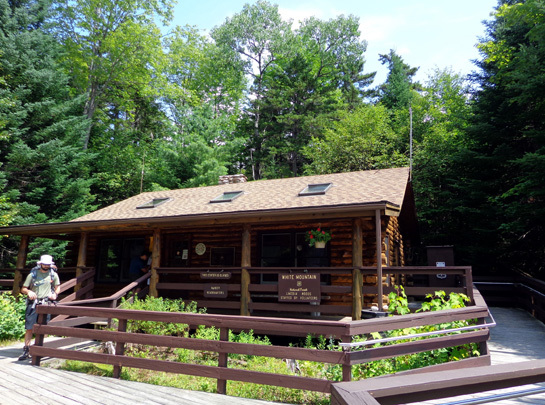 Several trails start at the visitor center, leading hikers through the Pemi Wilderness to various peaks and Franconia Ridge. 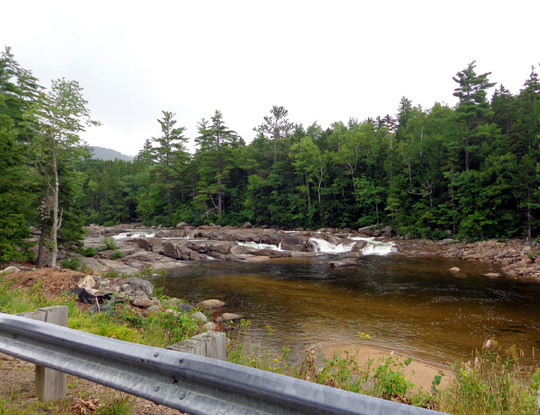 We completed our convoluted loop through the Whites by driving north from Lincoln on I-93 through Franconia Notch toward Twin Mountain without making any more stops because it was raining lightly again. That's OK. It gave us more time in the camper this afternoon to continue planning the logistics for our trip to the Maritimes.